The CAS TM Series tension meter dynamometer is the latest product to be added to the CAS Scale product line. The TM Series includes an easy to read LCD display and is also available for more demanding applications with a wireless option and the TWN Handheld Portable Indicator. 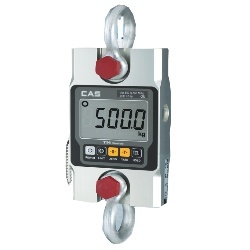 The CAS TM Series tension meter includes an easy to read LCD weight display and compact design for portable weighing. For added convenience, choose the wireless option upgrade with TWN handheld weighing indicator. Interfaces with industry standard Crosby shackles. Available from CAS Corporation authorized distributor, Central Carolina Scale. Call (919) 776-7737 for more ordering information.